If you want to try something sweet and a little different, these salted caramel tarts might be just the thing. I clipped the recipe from a Delicious Magazine when they had a chocolate special a while back, and the recipe was courtesy of Hannah Miles - a Masterchef runner up from a few years ago. I didn't particularly care for the chocolate pastry and the second time around I used Dorie's sweet tart dough, which is pretty foolproof. I made these a while back and I'm pretty sure I subbed cream for the crème fraîche as that was what I had on hand. This recipe calls for salted butter and as I always use unsalted butter, I added added some Fleur de Sel that I picked up from a shopping trip in France. Recipe makes 6-8 depending on size of tart cases. I used unsalted butter and a little French salt, but you can use salted butter as in the original recipe. Make the sweet tart dough and bake tart cases ahead of the filling, keep in an airtight container until ready to use. In a heavy based frying pan, dissolve the sugar in 60ml water over a low heat. Increase the heat until the syrup turns a deep amber colour. Don't stir the pan or the sugar will crystallise - you can swirl the pan a little to cook the caramel evenly. Take off the heat and leave to cool for 1-2 minutes, then stir in the butter with the pinches of salt. Set aside for 2 minutes and then whisk in the cream, beating until smooth and glossy. Transfer to a glass bowl and chill for 15 minutes to cool and thicken. Heat the chocolate, cream, butter and salt in a heatproof bowl over a pan of simmering water, stirring until smooth. The recipe says to loosely swirl the caramel and chocolate ganaches together and to fill each tart case with a generous tablespoon. 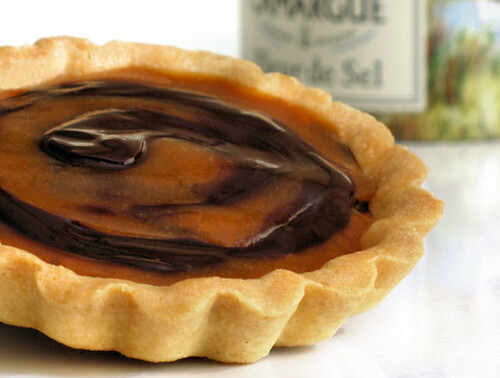 I found it easier to spoon the chocolate ganache into the tart and then swirl in some of the caramel with a spoon. Serve at room temperature with cream or ice cream if wanted. 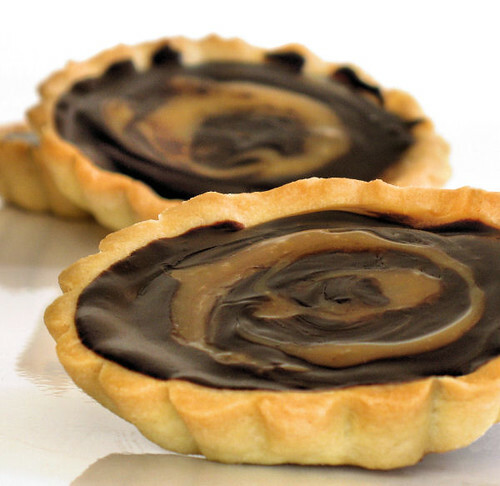 These chocolate and salted caramel tarts look sinfully delish!! Would love to try some one day. Thanks for sharing. yummy you need to open a pastry shop! Wow oh wow, these are truly amazing! What a beautiful recipe! I love this flavour! Your tartelettes are so cute and enticing ! Hang on Nic...save 1 for moi. I ♥ these. Fleur de salt? Now a trip to Paris? hmmm...I think I'll just stop by at Kent! what terrific aesthetic appeal! and that’s just the tip of the iceberg--caramel is one of my favorite chocolate mates, and salted caramel is even better. splendid. They look amazing! Bet the slat gave them a wonderful bite! Winning flavor combination and an impressive looking tart to boot! Wonderful. They look like a very very posh version of millionaire bars. Nic, what a chocolatey start to the weekend...wish I could taste it. 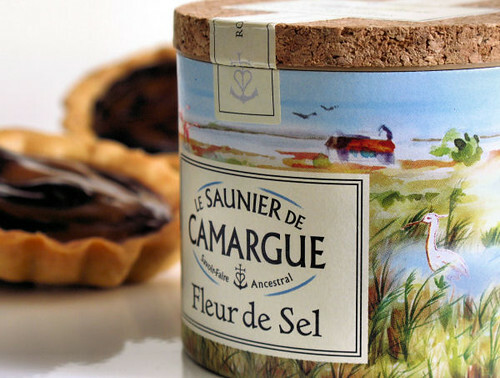 Is fleur de sel available here? OMG those tart look absolutely fantastic! Mmmm! Chocolate and salted caramel are such a wonderful combination and that crust looks amazing. Wish I had a bite. Nic they look GOOD! Paul would love those - I might give them a go and make them for him - thanks for sharing. These tratlets look fabulous & so attractive for my mouth & my senses!!! I love the little tarts! I think I would like better with Dori's pastry over a chocolate pastry too. Bookmarked this jewel! salted caramel is lovely. these tarts are tempting me. love the swirl and how it glistens! yummy yummy they look gorgeous!! Oh, man...I am sitting here with a MASSIVE sweet tooth looking at those pics..and I don't really have a sweet tooth at all! Thanks for all the comments, I have been away but will get around to your blogs soon! Sunita - you might be able to find the salt in Waitrose. These look like heaven on a plate, you make the best desserts! These look amazing! I have just found your blog via 'A Southern Grace', and I love it! I am going to make these when we have been for the weekly shop tomorrow! Your blog is sooo good! Oh MY....! This is probably one of my favourite flavour combinations and you have made them look so gorgeous. Tempted to make them ASAP! I stumbled across this post in a google image search for salted caramel, and couldn't resist clicking through for the recipe.